Fact: There are 168 hours in a week. Fact: There are 52 weeks in a year. Fact: God honors and is honored when His people seek Him. Imagine how the Lord would respond if the Church in our region were to seek His face for revival with day and night prayer for an entire year. 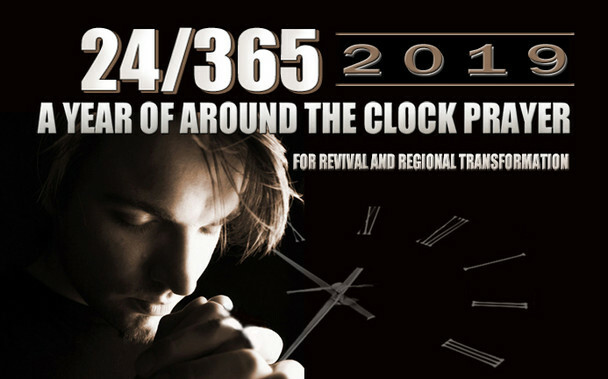 When 168 individuals answer the call of the Spirit to pray for an hour a week for an entire year we will find out! Of course there is no limit to the number of those who may participate and we would encourage all who desire to engage in this endeavor to do so. • Your commitment to pray each week for your hour is between you and the Lord. It should be viewed as a sacred trust. • Each hour of prayer can be filled by one person, two persons or a group. • Our goal is to ensure each that of the 168 hours was filled. • Each person who registers as a participant will be invited to gather (with all area believers) from 11 p.m. December 31, 2018 to 1 a.m. January 1, 2019 to begin our year of prayer. • We will gathering again at the end of our year of 24/7 prayer to celebrate all that God has done. • Periodic prayer/celebration gatherings are planned throughout the year for those who wish to attend. • We plan to keep in touch with all participants throughout the year via our web site, email and social media. This will include helpful articles; updates and testimonies. • We’re looking for people to help with organization of the prayer initiative. If you are interested in serving in this capacity or if you have any other questions or concerns please call us at 330-637-1421 or email us at ctbcsecretary@neohio.twcbc.com . To register or view the current PRAYER SCHEDULE click here.